Pre-entries: www.twooceansmarathon.org.za. Pre-entry is essential for this race and no late entries are accepted. Entries are limited to 11 000 entrants. The official entries closing date is 18 March 2019, but the entry limit has been reached earlier for the past few years, so runners are advised to not wait until the last minute. In order to participate in the Ultra Marathon, runners must run a qualifying marathon within five hours between 1 July 2018 and 18 March 2019. Note that all entrants must run a qualifier, including Blue Number Club runners and Internationals for safety reasons. No qualifier no entry. Temporary licenses are not available for the Ultra Marathon, and all participants must be paid-up members of a recognised running club in South Africa. The organisers will allow limited seeding changes and substitutions until 28 March 2019. However, no downgrades to the Half Marathon can be facilitated. Race number collection takes place at the Old Mutual Two Oceans Marathon Expo, taking place at the CTICC, Convention Square, 1 Lower Long Street, Cape Town from 17 to 19 April 2019. Participants must bring proof of ID and entry confirmation, as well as their RaceTec timing chip to receive their race packs. RaceTec timing chips can be purchased at the Expo. Two mighty ocean currents, one from the Equator and one from the icy Antarctic collide off the southernmost tip of Africa at Agulhas. It is here at the fairest Cape of all during the autumn season of Easter that over 10 000 runners line up each year to run the world's most beautiful marathon. The first 22 kilometres of this epic voyage are fairly flat and it is easy going from the start outside the famous brewery in Newlands, through the Cape Town suburbs of Wynberg and Plumstead. These first, early kilometres are run mostly in the dark. This is a good stretch to get your pacing right, check on your pre-race plan and reflect on the task ahead. A colourful bobbing mass moves forward through darkened streets as whistles and cat-calls bounce off on looking buildings. As the sun rises, you catch the earliest glimpses of the first ocean, the warm Indian. The following easy six kilometre stretch from Muizenberg, through St James, Kalk Bay, Clovelly and onwards to Fish Hoek provides ample opportunity to enjoy the beautiful view of False Bay bordered by the Cape Peninsula Mountains on one side and the Hottentots Holland Mountains on the other. On occasion you may have to do battle with the notorious Cape Doctor, the Southeaster wind. But with some luck, on a calm day, this could be the single factor that helps the ambitious to get a silver medal and the desperate to make the time limit. Bask in the morning light of the quaint and gaudy village atmosphere that makes up this undemanding passage. Here you pass some celebrated heritage sites, Rhodes Cottage and the Edwardian Beach Houses to name but a few. There is always a friendly and enthusiastic reception from the residents of Fish Hoek as you approach the abrupt "bump" and right turn at the far end of the town. To do well in the Two Oceans Marathon it is wise to approach the race with disciplined caution up to this point. The run up this section should feel like nothing more than a slight pull on the legs. 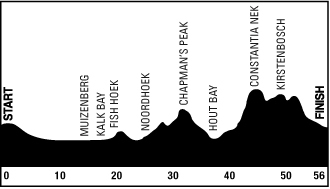 Between 22 and 25 kilometres lies a mentally tricky stretch with little to distract you from the slight gradient. Soon the Indian Ocean disappears from your view and the route winds its way along Kommetjie Road. Expect an exuberant throng at Sun Valley and Louw's Corner and take care not to be sucked into the crowd’s energy here, for the real work still lies ahead. The halfway mark at 28 kilometres is some way before deceptive Little Chapman's. This stretch of slight inclines and some flat running provides good opportunity to drink and to mentally prepare for the real test ahead, Chapman's Peak. Focus on the magnificent view across Noordhoek Beach as the icy Atlantic Ocean greets you, rather than on a sometimes testing gradient. From the base of the Peak to its final dramatic drop into Hout Bay some ten kilometres away, what follows must surely be the most attractive miles in the entire running world. With a rugged wall of rock on the one side and the icy blue ocean far below, this is a rare treat. It is here that the race surely earns its reputation as the world’s most beautiful marathon. Chapman’s Peak is a steep and hard slog, make no error. It will force your pace to slow. Perhaps it is just as well, because the majestic view of both mountain above and moody Atlantic below is something that will remain with you long after the pain and discomfort of the charge down the badly cambered road into Hout Bay is forgotten. Do not be fooled by the rocky outcrop masquerading as the top of Chapman's Peak - the real one is around the corner, about a kilometre further on. Beware of the enthusiasm that may overtake you here for each horizon appears to be a summit, each summit a mirage. Restraint now will be rewarded on the other side of the Peak. Sooner than expected, you reach that illusive top where a welcome refreshment point awaits you at a height of 180 metres above sea level. As you descend Chapman's Peak into Hout Bay, your legs will take a hammering. Across the bay, the charming fishing harbour watched on silently by the rocky outcrop of the Sentinel once again underscores this race’s reputation. With an unpretentious flamboyance the town welcomes you with a generosity that can only be found in a place of such abundant beauty and culture. This is more than enough to lift flagging spirits and provide a pleasant distraction from the discomfort experienced while re-adjusting to the flat surface. Look around and you will see the gun batteries built by the British during the Napoleonic wars to protect the bay. The bronze statue on a rock overlooking the bay honours a leopard who sat there for hours in days gone by. The monstrous scramble up Constantia Nek begins almost imperceptibly at the 40-kilometre mark outside Kronendal. This is a landmark which boasts the oldest homestead in Hout Bay. The climb, with its many twists and turns becomes harder and steeper as the hill progresses. It is not the scenery, but the hill that now occupies your mind. Resolve to keep on running, even if it is reduced to only a shuffle. It is perfectly respectable to walk up this section. On reaching the summit, there is great reward. You will be greeted by thousands of enthusiastic spectators and television cameras. Pause and look back, you have climbed 215 metres in just over six kilometres. Mercifully the 46-kilometre marker heralds the summit of Constantia Nek. This is a good time to raise your arms and steady yourself for the final assault. The Two Oceans Ultra Marathon is known as a formidable challenge and there are still a few more demanding surprises in store. As you run through Cecilia Forest there are two unpleasant little climbs both with unmentionable names, between 48 and 50 kilometres. On the cool wooded slopes of the mountain it is the sheer beauty of the area and the enthusiasm of the warm Cape Town crowd that will pull you, now tired but heroic, along this shaded road. From Kirstenbosch with only four kilometres left your thoughts turn to the finish as you canter straight on down the hill. The route continues along the cool and beautiful tree-lined Rhodes Drive, imposing mountains tower on your left. At the 53rd marker board you take a sharp upward turn to the left into Union Avenue. Here lies a challenging little rise known by many names but relished by few. The end is finally in sight, Union Avenue is the double carriageway that takes you to the university’s rugby fields and the finish. Remain in the left-hand lane, the majestic slopes of Devil's Peak tower alongside as you enter the Upper Campus of the University of Cape Town. The hard work is done; all that is left is the length of the two rugby fields before a cheering and colourful crowd. This is a moment you will treasure forever. At last the world’s most beautiful marathon has drawn to a close and at Drake’s ‘fairest cape of all’ you fondly cherish one of life’s most challenging and awe inspiring "voyages of discovery". Gold medals and cash prizes go to the first 10 men and women in the open category. Cash prizes also go to men and women in the 40 to 49, 50 to 59 and 60-plus age groups. The first man and woman from Western Province each get R10,000. Silver medals go to all finishers from 11th position to finishers within 04:00. The Sainsbury medal goes to those finishing between 04:00 and 05:00. All other finishers within the 06:00 time limit get bronze medals. Blue medals go to all finishers between 06:00 and 07:00. Title sponsor Old Mutual also offers a prize bonus of R1 million to the first man and/or woman to breaks the Ultra Marathon record in 2019. The well-attended Expo at the Good Hope Centre in Cape Town is open three days prior to the race. At the UCT finish there are toilets, showers, food vendors and refreshments. Parking is adequate and there is a tog-bag tent, beer tent with a big screen TV as well as a club gazebo area. An official race photographer is in attendance. A shuttle bus provides free transport from the finish to the car parks at the neighbouring schools. The Old Mutual Two Oceans Ultra Marathon has been consistently voted in a number of our surveys as a well organised and well-presented event. Over the last years it achieved distinction as one of South Africa’s top quality races. The race will be run for the 50th time in 2019. Race Number Collection: The registration venue of the Old Mutual Two Oceans Marathon Expo is at the CTICC, Convention Square, 1 Lower Long Street, Cape Town. Detailed instructions will be emailed out with the race acknowledgement during March 2019. Seeding: All 2018 gold and silver medallists will be seeded in Group A. Runners wearing Blue and Yellow numbers will be seeded in the C group unless they qualify for a higher group. Runners who post a 03:00 marathon qualifier time and silver medallists from 2018 are entitled to preferential seeding. The rest of the field will be seeded according to their qualifying race time. General: This dramatic race has had its fair share of surprises. In 1976 Vincent Rakabaele beat the Comrades Marathon king, Alan Robb by a mere six seconds in a winning time of 03:18:05. This excitement was to be repeated in 1983 when Siphiwe Gqele beat Warwick Ewers by a margin of only four seconds. An outstanding run in 1988 by Thompson Magawana lowered the record to 03:03:44. This must surely go down as one of the greatest ultra-distance runs of all time, given the severity of the route. To date both the men’s and women’s route records have stood the test of time. The race is run from gun to mat. Runners who have not reached the cut-off marks in the time specified will not be allowed to continue. Sun Valley - 25 kilometres at 09h40. Halfway, Main Road – 28 kilometres at 10h00. Outside the Four Seasons Guest Farm – 42,2 kilometres at 11h50. The averages indicate an 85% chance of finishing, with 3% of the field achieving silver glory. This ranks as the most difficult ultra in which to earn a silver medal in South Africa. The following percentages indicate which medal is earned on the day: 16% Sainsbury, 41% Bronze and 40% Blue. The Old Mutual Two Oceans Marathon is certainly popular with out-of-towners with 72% of the field coming from outside the Western Province. Gauteng participants make up 25% of the field, and KwaZulu-Natal 6%. Last year over a third of the field ran the Two Oceans Marathon for the first time. Women are running this race in ever increasing numbers. In 1986 only 6% of the field were women; in 2018 this number had increased to 29%. The event organisers regularly promote the race overseas with the intention of attracting top class runners to South Africa. It is their commitment to grow the Old Mutual Two Oceans Marathon to be the premier Ultra Marathon in Africa. In 2018, there were 1,147 international runners from 64 countries. The biggest contingent of international runners was from the Germany, followed closely by United Kingdom and then the USA. Many of these runners have indicated that they will be back. The Two Oceans International Friendship Run was introduced in 2007. All international entrants are invited to meet at the V&A Waterfront on Good Friday morning, 19 April 2019 at 09h30 for a scenic run/walk through Cape Town, taking in historical landmarks and key points of interest. Participants jog with the flag of their respective country. All runners are required to wear a RaceTec timing chip during the race: no chip, no results. Permanent numbers will be awarded to all runners who have completed 10, 20, 30 and 40 races within the time limit. The Old Mutual Two Oceans Marathon is televised live on SABC Two with a 60-minute highlight package aired at a later stage. The Two Oceans Marathon is a runner's race and the experience of a lifetime. It is a definite personal favourite. Visit www.twooceansmarathon.org.za, the official Two Oceans Marathon website for more information.